Let him who is to be received make before all, in the Oratory, a promise of stability, conversion of manners, and obedience, in the presence of God and of His saints, so that, if he should ever act otherwise, he may know that he will be condemned by Him Whom he mocketh. Let him draw up this promise in writing, in the name of the saints whose relics are in the altar, and of the Abbot there present. And let him write it with his own hand; or at least, if he knoweth not how, let another write it at his request, and let the Novice put his mark to it, and place it with his own hand upon the altar. When he hath done this, let the Novice himself immediately begin this verse: “Take Thou me unto Thyself, O Lord, according to Thy Word, and let me not be let down in my expectation.” And this verse let the whole community thrice repeat, adding thereto Gloria Patri. Then let the newly-received brother cast himself at the feet of all, that they may pray for him, and from that day let him be counted as one of the community. Whatever property he hath let him first bestow upon the poor, or by a solemn deed of gift make over to the Monastery, keeping nothing of it all for himself, as knowing that from that day forward he will have no power even over his own body. Forthwith, therefore, in the Oratory, let him be stripped of his own garments, wherewith he is clad, and be clothed in those of the Monastery. And let the garments that are taken from him be laid by and kept in the wardrobe; so that if ever, by the persuasion of the devil, he consent (which God forbid) to leave the Monastery, he may be stripped of the monastic habit and cast forth. But the form of his profession, which the Abbot took from the altar, shall not be given back to him, but be kept in the Monastery. Nowhere is the Eucharistic subtext of the Rule of Saint Benedict more apparent than in Chapters LVIII and LVIX. 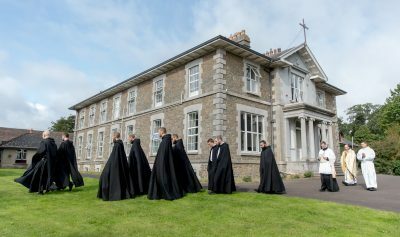 The entire rite of monastic profession is presented as an oblation or, if you will, as a sacrificial immolation. The monk is a victim (hostia) offering himself to the Father, through Christ, the Eternal High Priest. Saint Benedict sets the rite of monastic profession in the oratory of the monastery, that is, before the altar, the place of the Holy Sacrifice. There, with the Church on earth and in heaven as witness, he promises stability, conversion of his life, and obedience. The saints in heaven, represented on earth by the holy relics venerated in the altar of the monastery church, look on as the new monk lays his very life upon the altar. The saints intercede for the remission of his sins, that he may walk — no, run with all endurance — henceforth in newness of life, until at length he reaches the heavenly Jerusalem where they will welcome him into the choirs of the blessed. Saint Benedict directs that, after the chart has placed upon the altar, the novice himself is to intone this verse: Suscipe me, Domine, secundum eloquium tuum, et vivam: et non confundas me ab expectatione mea, “Take Thou me unto Thyself, O Lord, and I shall live; and let me not be confounded in my expectation” (Psalm 118:116). Whenever Saint Benedict wants to emphasize a particular verse, he orders its threefold repetition. In this instance, not only does the newly-professed monk sing the verse three times; it is also repeated three times by the whole community, and crowned with the singing of the Gloria Patri. This confers upon the singing of the Suscipe a character of solemnity and grandeur. It signifies the moment in which the Father lays claim to the self-offering of the new monk, in whom He recognizes the pattern of His own Beloved Son’s immolation from the altar of the Cross. Saint Augustine says that whatsoever is placed upon the altar becomes sacrificium, a true sacrifice, that is, a thing irrevocably made over to God alone. Saint Augustine’s exposition of the meaning of sacrifice is fundamentally related to Our Lord’s use of the word ἁγιάζω in the Priestly Prayer of the Fourth Gospel. When Our Lord says,”and for them do I sanctify (or consecrate) myself, that they also may be sanctified (or consecrated) in truth” (John 17:19), He is, in effect, saying, “and for them do I make myself a sacrificial victim, that they also may be made sacrificial victims in truth”. The chart of profession, signed by the monk and placed upon the altar, represents the monk’s identification with the bread and wine that there become the adorable Body and precious Blood of the “the Lamb slain in sacrifice ever since the world was made” (Apocalypse 13:8). Suscipe, Sancte Pater . . . Take unto Thyself, Holy Father, almighty and everlasting God this unblemished sacrificial offering, which I Thy unworthy servant, make to Thee, my living and true God, for my countless sins, offences, and neglects, and on behalf of all who are present here; likewise for all believing Christians, living and dead. Accept it for their good and mine, so that it may save us, and bring us to everlasting life. Amen. In spiritu humilitatis . . . Humbled in spirit and contrite of heart, may we find favour with Thee, O Lord, and may our sacrifice be so offered in Thy sight this day that it may please Thee, Lord God. Take Thou unto Thyself, O Holy Trinity, the offering we here make to Thee in memory of the passion, resurrection, and ascension of Our Lord Jesus Christ; in honour, too, of blessed Mary, ever-virgin, of blessed John the Baptist, of the holy apostles Peter and Paul, of these, and of all the saints. To them let it bring honour, to us salvation, and may they whom we are commemorating on earth deign to plead for us in heaven: through the same Christ our Lord. Amen. Pray brethren, that my sacrifice and yours may find acceptance with God the almighty Father. R. May the Lord accept the sacrifice at your hands, to the praise and glory of His Name, for our welfare also, and that of all His holy Church.